A couple of weeks ago, I made a startling realisation. In the midst of my early morning gym excursions and the rush to get to clinic on time, my day to day breakfasts rarely consist of anything other than porridge, cereal, or granola. I am, in essence, a vegetarian by morning. Shocked, disgusted, and filled with a sense of self-betrayal, I sought the help of my GP, who advised that since my anti-vegetariantigens were already at an adequate level, I should carry out some self-meatication instead. Alas when I returned home, I found that my emergency meatical cabinet was all but bare, and just as I began to lose hope, I received a knock at the door. To my delight, Halalnivore had caught wind of my “dilamba”, and sent over a chilled box of fresh, vacuum-packed meat. For those of you who are unfamiliar with them, Halalnivore is a halal gourmet meat club who have tasked themselves with an ongoing mission to give local butchers a run for their quality. Grateful for their relief efforts, I set about trying to boost my “immoone” system, and have conjured up a couple of meaty breakfast ideas that you too can try at home. Many of you will know that I’m a big (-bellied) advocate for combining sweet and savoury, so a pancake burger seemed like a natural choice. Sweet, fluffy pancakes, succulent Angus beef, and smokey turkey bacon. Delicious, diabolical, and absolutely deadly. This recipe is fairly similar to our original pancake recipe, but goes a little bit easier on the fat – (but not by much). Sieve the self-raising flour and baking powder into a mixing bowl. Add the sugar and mix to distribute evenly. Place the butter in a bowl and melt it in the microwave. (The butter, not the bowl). Then, add the eggs. Beat the mixture together. Pour the milk and the egg/butter mixture into the flour, and mix until lumpy. Carefully pour the mixture into a blender, and blend until smooth. Carefully transfer the mixture from the blender, back into the mixing bowl, and whisk thoroughly. Pour into a hot pan, over a low-to-medium heat, according to your desired size. (Note: Use a very light amount of oil or butter, ideally on a non-stick pan). Wait for the top of the mixture to begin bubbling, and then flip the pancake over to the other side. A 6oz beef patty for each person. (We used Halalnivore’s 6oz Angus beef burgers). Two strips of turkey / beef bacon. (We used Najma’s smokey turkey bacon, but Halalnivore have since launched their own beef bacon!). An egg. (It’s not breakfast without an egg). We recommend using a hot pan or skillet to sear and cook the burgers. Whilst the pancakes are cooking, put a separate pan on a high heat, (add a bit of oil if you wish), and sear each side of the burger(s) for about a minute. By the authority of HaloodieFoodie and SeriousEats, be sure to flip your burger frequently to achieve a more even cook. Cook the burger to your preferred doneness. We recommend investing in a meat-thermometer and cooking to around 60°C for a medium-rare/medium cook. Finally, fry the egg(s) and the turkey bacon, construct the burger, and finish it off with a drizzle of maple syrup. 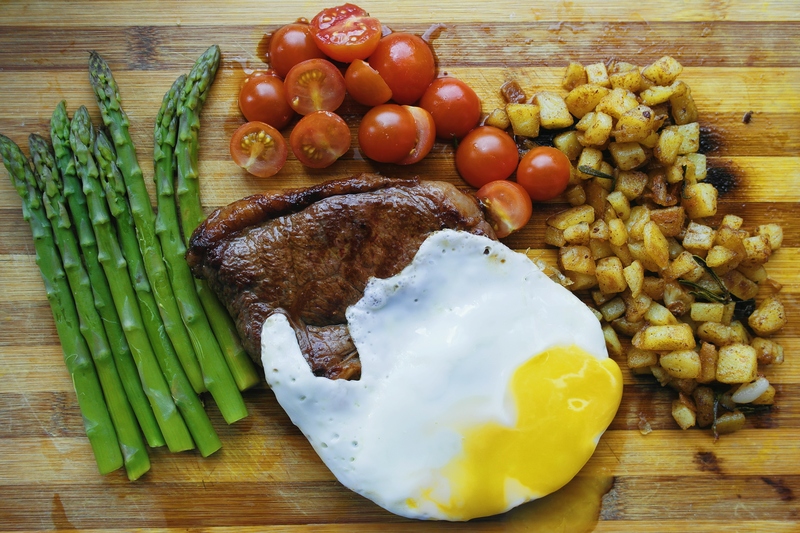 Amongst the bodybuilding world, a hearty plate of steak & eggs is the king of all breakfasts. Here, we’ve cooked it up with a side of sautéed potatoes, steamed asparagus, and cherry tomatoes. A steak (obviously). (We used Halalnivore’s 8oz Irish rump steak). A couple of eggs. (Complex ingredient list so far). Firstly, decide whether you’d like to salt your steak in advance – (either by one day or by one hour), or immediately before searing. Do NOT add pepper before searing – it could burn and impart a charred taste. Take your steak out of the fridge and dab the surface of the steak thoroughly until it is dry. (This ensures a better crust). Peel and chop the potato into small chunks, and heat them in a pot of boiling water to soften them up. For the sake of efficiency, you can place the asparagus in a colander over the pan, cover them, and let them steam alongside it. (Alternatively, steam the asparagus right at the end). Place a skillet / pan on high heat. When it’s nice and hot, place around a tablespoon of olive oil in the pan and spread evenly. If you haven’t salted your steaks in advance, do so now with a generous amount, rubbing it right into the surface of both sides. Sear the steak for around a minute on each side. Add the garlic, rosemary/thyme, and a knob of butter (about an inch or so thick), and rub and baste the steak as you cook it. Flip the steak every 30-60 seconds, to achieve an even cook. We recommend using a meat thermometer, and cooking the steak until it reaches your desired doneness. (60°C for medium-rare). Once your steak has been cooked, take it off the pan and leave it to rest for around 10 minutes. Season with pepper at this point if desired. In the meantime, throw the potato chunks into the mixture of oil and juices left behind by the steak, and stir thoroughly to sauté them, adding more oil if necessary. In a separate pan or pot, fry or poach your eggs. 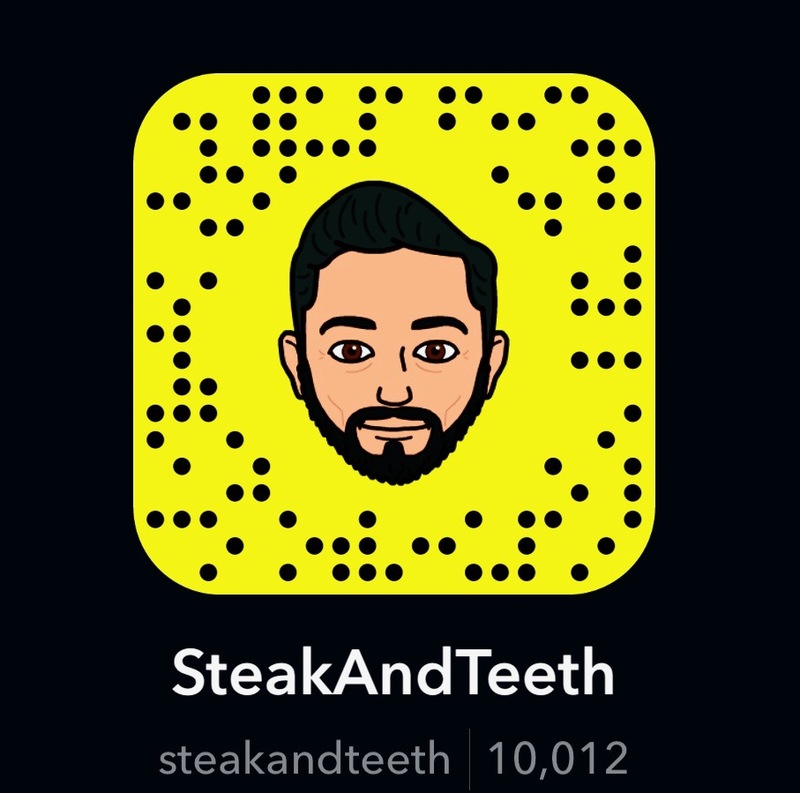 Finally, put everything together, and once your steak has been rested, cut in and feast like Arnie himself. And there we have it – a couple of meaty breakfast ideas to counter those vegetarian mornings. 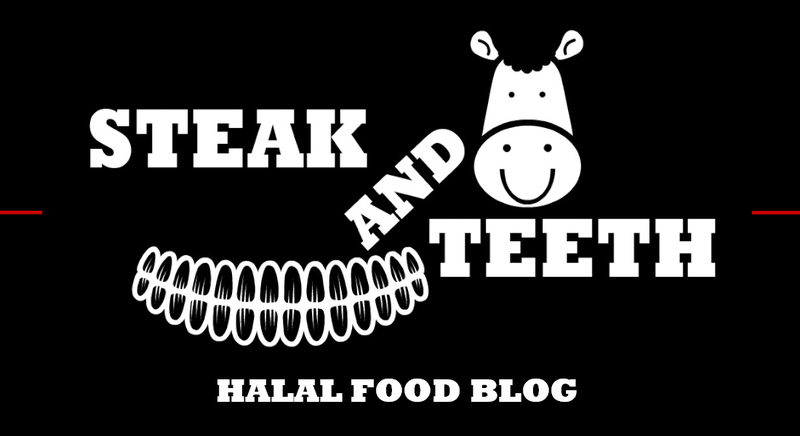 Let us know how you get on, and keep an eye out for our upcoming lunch and dinner entries in this Halalnivore series. Disclaimer: This is not a sponsored post. We were given a Halalnivore starter box to sample and make use of as we please.